Home » Sportmix Wholesomes Grain-Free Whitefish and Chickpea 40 lb. Sportmix Wholesomes Grain-Free Whitefish and Chickpea 40 lb. Wholesomes™ Whitefish Meal and Chickpeas Grain-Free formula is formulated to provide a highly digestible grain-free, gluten-free diet to support your dog’s overall nutrition. 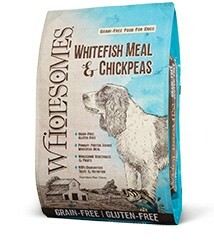 Wholesomes™ Whitefish Meal and Chickpeas is the farmlands finest and is made with high quality protein and farm-grown vegetables and fruits to provide the energy and nutrients needed to maintain excellent health. Wholesomes™ nutritionally balances Omega-6 and Omega-3 fatty acids to promote good skin and hair coat. This antioxidant formula is fortified with Vitamin A & Vitamin C along with nutrient-rich vegetables and fruits like peas, chickpeas, apples, blueberries, cranberries, carrots & spinach. Wholesomes™ supplies your pet with a naturally preserved, 100% complete and balanced diet for a healthy active life. Wholesomes™ Whitefish Meal and Chickpeas is formulated to meet the nutritional levels established by the AAFCO Dog Food Nutrient Profiles for all life stages including large size dogs (70 lbs. or more as an adult). Whitefish Meal, Potatoes, Peas, Chickpeas, Canola Oil (Preserved with Mixed Tocopherols), Sweet Potatoes, Pea Fiber, Natural Flavors, Dicalcium Phosphate, Flaxseed, Dried Egg Product, Apples, Blueberries, Cranberries, Carrots, Spinach, Salt, Potassium Chloride, Choline Chloride, DL-Methionine, L-Lysine, Taurine, Yucca Schidigera Extract, L-Carnitine, Beta-Carotene, Vitamin A Supplement, Vitamin D3 Supplement, Vitamin E Supplement, Zinc Sulfate, L-Ascorbyl-2-Polyphosphate (Source of Vitamin C), Ferrous Sulfate, Niacin, Calcium Pantothenate, Riboflavin Supplement, Copper Sulfate, Pyridoxine Hydrochloride, Thiamine Mononitrate, Manganese Sulfate, Zinc Proteinate, Manganese Proteinate, Copper Proteinate, Calcium Iodate, Cobalt Carbonate, Folic Acid, Sodium Selenite, Biotin, Vitamin B12 Supplement. Wholesomes™ Whitefish Meal & Chickpeas is formulated to meet the nutritional levels established by the Association of American Feed Control Officials (AAFCO) Dog Food Nutrient Profiles for all life stages including growth of large size dogs (70 lb. or more as an adult).